The New York Times recoge en su edición del viernes 13 de julio una amplia información sobre los avances del proyecto Hiriko, del que ya se están produciendo 20 unidades para las pruebas en varias ciudades del mundo. Este proyecto liderado por el MIT y un grupo de empresas vascas está atrayendo un gran interés internacional. Tanto entre las autoridades relacionadas con la gestión de la movilidad urbana de las principales ciudades, como entre los medios de comunicación (tal y como hemos recogido en numerosas informaciones). Estamos seguros de que en breve tendremos noticias e imágenes de los primeros Hirikos recorriendo las calles de ciudades en todos los rincones del mundo. FOR all their attractions, electric cars can be hard to justify on a practical basis. Factors like a comparatively high initial cost — and a limited ability to make long trips — cut into their viability as mass-market transportation. But runabouts like the Hiriko, a two-seat microcar prototype designed specifically for urban car-sharing programs, offer a promising solution to gaps in today’s transportation network. 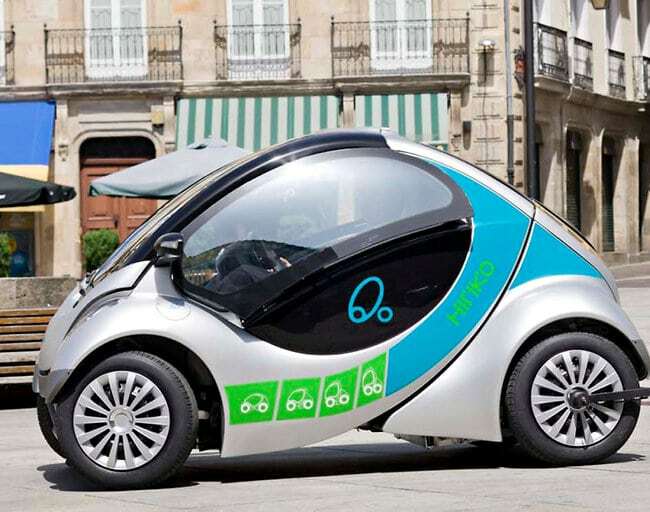 Short-distance car sharing with electrics could help bridge the gap between a commuter’s home and mass transit — the so-called first-mile problem — or from mass transit to the workplace, the last-mile problem. Beyond bike-share, easier than Zipcar, the next new thing in getting around town with a light carbon footprint may be Hiriko, a two-passenger electric vehicle developed by the Changing Places research group at MIT’s Media Lab. A production run of 20 prototypes begins next year at Vitoria Gasteiz, in northern Spain. (Hiriko means “urban” in Basque.) But it may be several years before they see wide use. Anyway, don’t dream of buying one of your own. The wee cars aren’t meant for private ownership. Instead they will be stationed in fleets, as complements to city transit systems. Likely first locations include Barcelona, Berlin, Malmö, Hong Kong, and San Francisco.